Barman leaned over counter. Kept hands where I could see them. Wise move. "I don't want no trouble," he said. "Finish your beer and get out." Waitress had told him. My fault. Should have put on sunglasses before coming inside. "Thanks for hospitality," I said. Opened door, went out. Don't know what I'd been looking for. Companionship? Mix with normal people? Stupid. Old life was gone. Had to accept. Cop car turned corner, lights flashing, stopped. Big Texas Sheriff got out, hand on gun. Didn't draw it. "You there, stay where you are," he said. "Take off your sunglasses." Did as ordered. Sheriff got jittery. "Raise your hands above your head, boy." "Turn around, put your hands against the wall." Sheriff stepped closer. Red face, cold eyes. Lips formed hard line. Made decision, drew gun. Left him lying there. Don't like to kill cops, fellow soldiers. Had no choice. Not my doing. Don't they understand? Pickup stopped in street. Four men, two inside cab, two in back. Positive ident on driver, was in bar earlier. Left to get friends. Two hunting rifles, one pistol. Saw Sheriff and started shooting at me. Emptied cop's gun, killed riflemen in back, killed passenger with pistol. Driver jumped out, ran down alley. Picked up rifle, chambered round, fired. Right knee, one hundred fifty paces. Enemy disabled and ready for interrogation, Captain. Then I remembered, Captain Adams was dead, swimming with the fishes. Faces at bar window, afraid. Looked for sunglasses. Broken. The hell with it. Pulled bodies out of pickup, got in, shut door. Looked in rear-view. Silver eyes. Sign of the Adjusted. Sign of the Devil. Heard cop siren in distance. Started engine, got out of there. Drove north, seventy miles. Rolled into town, gas tank on empty. Hid pickup in alley. Found diner, sat down. Dark, nearly empty. Peaceful. Waitress didn't look at me, just wrote order. Food smelled good. Nobody bothered me. Order came. Waitress looked at me after she put plate down. Long, hard stare. Didn't want her to be afraid. "All I want is some food," I said. "Then I'm gone." She nodded. Funny look. Not afraid. Something else. Ate fast. Needed chow. Body fuel. Two cars stopped outside diner. Five civilians climbed out, looked through diner window. Someone pointed me out. Kept eating. Three men came inside, two stayed outside. Armed, rifles and shotguns. Re-assessment: paramilitary, not civilian. Wanted to collect bounty. Waitress shouted for diner owner. He came running. "Not in here," he said. Leader wasn't happy. "Emergency Law says we can kill this turkey wherever we like." "Then you pay for any damage, and you clean up the mess." Leader didn't like that. "Take him round back, we'll deal with him there. You, soldier boy. Get up and keep your hands where we can see them." Aimed shotgun. Mistake. Triggers reflexes, sunk too deep to remove or re-train. Priority Alpha: react to immediate threat, kill or secure for interrogation. Dived, rolled, came up with fingers rigid. Leader fell, throat crushed. Second man tried to shoot, knife-eyeball-brain. Third man saw my eyes, panicked, fired, missed. Killed diner owner instead. Civilian death triggered another Alpha response. Heel of hand shattered breastbone, drove gunman through window. Went after him, surprised two gunmen outside. Crotch, solar plexus, throat. Negative interrogation, Captain. Rifle discharged, missed. Separated skull from spinal column. Negative interrogation. Crouched behind car, scanned for enemy snipers. Clear. Grabbed rifle. Climbed into car, started engine. Passenger door opened. Nearly killed waitress, stopped just in time. "Drive!" she said, sliding into seat. Did as ordered, yes Ma'am. Two miles outside town, she spoke. "My brother is in the Corps." "I hardly expected you to know him personally. But you were out there, weren't you? You're one of them." Night came. No sign of pursuit. Expected cop cars, maybe helicopters. Initiated wide angle scan, infra red vision. Nothing. "Yes Ma'am, I'm one of them." She turned her head to look at me. She took a deep breath, then said, "Identify." "Bleskoe, Joseph Thomas, Corporal, KR-678-436, 77th Assault Regiment, United Earth Defense Corps." Nervous laugh. "That was automatic, wasn't it?" "Yes," I told her. "Programmed response to low-level query." "And that's how you kill? A programmed response?" My turn to look at her. "Yes, Ma'am, that's how I kill." She was quiet for a while. I just drove. "What if I told you to kill someone?" Laughed again. Brittle sound. "What if," she said, "an enemy soldier shouted identify in the middle of a fight?" "Battlefield conditions deactivate low-level responses. I'd shoot the enemy soldier." That shut her up. Another mile before she spoke again. "You were aboard Vesuvius, weren't you?" "Not much to tell, Ma'am." "Stop calling me that! I'm not your officer. My name's Kate, Kate Moore. My brother's name is Steve. Your ship made it back to Earth. What happened then?" Closed my eyes for a moment. Memories came back, clear. "You already know," I said. "I only know what they told us. I want to hear your side of the story." "All right. We wiped out the enemy's satellite defenses and landed on their home planet. Fought our way into their command center and knocked out their battle computers. Ended the war." "Waited for evac. Ship never arrived. Casualties started dying. Captain Adams commandeered a shuttle and got us up into orbit. Boarded supply ship Vesuvius and set course for Earth." "Refused permission to land. Ordered us to stay in orbit until decontamination procedure was worked out. Captain Adams said we'd have to wait. We waited. Days, then weeks. No medical facilities, no coldsleep. Had to eject our dead into space. Captain kept asking for update. Communications blackout, no reply." "Detected tugs coming in from Luna. Said they were going to tow us out of parking orbit. Didn't say to where. Didn't say why. Captain kept asking. No answer. Sixteen of us dead by then. Combat effectiveness of unit threatened. Priority Alpha, the unit must survive. Captain initiated emergency re-entry sequence." "And came down in the Gulf of Mexico?" "Just tell me what happened once you splashed down." "Ship sank fast. Most of us got out. National Guard gunships tried to shoot us in the water. Captain Adams and three wounded acted as live decoys. Brought down two gunships before the others got them. Nineteen of us swam ashore and ran." "And you've been running ever since." "The unit must survive," I told her. Shrugged. Why didn't she understand? "When they passed the Emergency Law authorizing all citizens to shoot you on sight, I couldn't believe it," Kate said. I grinned. "Us, neither. Heard it over radio. We split up, otherwise too easy to track. Don't know how many are still alive. Maybe only me." "Can't you turn yourself in?" "Why? So they can keep me in a high-security cell for the rest of my life? They're afraid of me. They won't let me go. Isn't just the cyborg implants. It's the stuff they did to my nervous system. It's what they put in here." Tapped side of head. "Had to go deep, so couldn't be altered by the enemy if captured." "So what's your plan? To keep running, forever?" "No one can run forever. Some day, probably soon, someone will put a bullet in my brain. Then it'll be over. But until then, no choice. Got to keep moving." She looked sick. Covered face with hands, sobbing. "Sorry," I said. "Didn't mean to frighten you." "You didn't," she said after a while. "It's justthe war's over, so Steve will be coming home soon. But he went through the same adjustments you did." She closed her eyes, sighed. "I can't help but think about his last message." She paused, then went on, "We received the message after the Vesuvius incident was reported on the news and the Emergency Law was passed. He didn't refer to it directly"
Made sense. He knew the same thing would happen to him. To all Adjusted units. Authorities had problem. Couldn't insert sixty thousand killer cyborgs back into society. God help society if one of us ever got road rage. Windshield shattered, car rolled over into ditch. Kicked door open, dived out. Firing continued, coming from all sides. Six cop cars blocked road. Unmarked truck, military. Waiting for me. Red spot touched my chest. Moved fast, bullet missed. Ran, jumped, slid over cop car roof. Two cops gaped, surprised. Disabled for interrogation. Red dot tried to find me again. Killed cop with shotgun. No choice. Another swung K-stick. Cut it in half, put cop through windshield. Picked up shotgun, fired at bushes. Sniper stopped shooting. Second red dot touched shoulder. Bullet missed. Picked up pistol, fired two rounds into second sniper's position. Shot cop car, blew fuel tank, blinded/disorientated cops. Disabled for interrogation. Soldiers near truck saw me coming, tried to shoot. They were fast but I was faster, killed them, killed them all. Army badges but eyes weren't silver. Regular troops. Human troops. Dead troops. Went back to car, pulled Kate out. Shaky but not hurt. Got her into cop car, drove away. Felt pretty good about leaving some cops alive but Kate was crying and choking and crying. "Dear God, you slaughtered them like animals, just like you killed those men at the diner." Shook my head. "Not all of them. Only the ones who tried to kill me. Programmed reaction to threat. Someone points a gun at me, I kill them. If not, disable for interrogation." "Disable for? God, is that what Steve will say when he comes home?" Wanted to say something to help. No good. Nothing to say. Her brother was one of us. Adjusted, programmed to kill. We'd won the war. Earth was losing until Adjusted forces deployed. We made the difference, fought enemy to a standstill, saved Earth. Did the job. Drove into next town with lights out. Stopped in alley. Kate shivered, watching me. Leaned past her, opened door. "Tell them I kidnapped you and used you as a hostage," I said. She nodded, still shivering, and got out. Next morning was bright, warm. Drove north, crossed state line. No cops, and no one chased me. Looked for gunships but sky was clear. Captain Adams had told us, Move fast, strike hard. Hurt them. Disrupt communications and supply lines. Don't let them forget about us. Damn right, Captain. Car went past, driving in opposite direction. Hit brakes hard, skidded, stopped. Turned in a circle, went back. He did same. Stopped in middle of road, got out. Didn't know him, he didn't know me. But his eyes were silver like mine. We embraced like lost brothers. Wiped away tears. Can still cry. They didn't take that away from us. "Got company coming," he said. "Have to go." "When did you get in?" "Last night. Splashed down off coast. You?" "Vesuvius," he said, grinning. "You led the way." Grin vanished. Became serious. "Listen up. Six transports grounded outside New York last night. Another four came down near Atlanta. More coming in tonight, Washington D.C. New Alpha priority: secure landing zones, neutralize all attempts to deny incoming transports." "Alpha priority accepted," I said, and life was suddenly a lot more simple. Got back into cars and drove. NatGuard gunships clattered by overhead, chasing him. They didn't stand a chance. Captain Adams said the authorities will have to deal with us, one way or the other. Or the Adjusted will deal with them. War isn't over yet, but it soon will be. Well I gotta hand it to Roach, this is a damn fine pickup. This is perhaps one of the best stories I have read in the last few months and even if it was a tad cliche it was cliche well done. Though the ending wasn't really a surprise to me it was satisfying and that all a good story can ask for. I look forward to more work from this writer. Maybe a conclusion to this story. That would be good, good indeed. Ask him Roach. Great work! Interesting from a military perspective, since we get to see what becomes of the soldiers after the explosions stop. The protagonist was a good sympathetic character, despite his frequent acts of violence. Like Kisanthe I've been making the aquaintance of Mrs Dalloway and Mrs V Woolf recently (and not enjoying their company) so this was a pleasant surprise. The stream of consciousness was more of a torrent and and exhilerating ride. Thanks for a great read Derek. It's not long and yet it manages to set-up the background story, give a glimpse of the main protagonist's life and make the reader wish it were longer. Here's hoping you publish many more. In other words, great job! Good story. Very impressed. Good use of language. Nice sustained mood. Liked soldier. Liked waitress. Need new sunglasses. Thanks for writing it. I really liked this one. The speech style at first kind of threw me until I caught on that this wasn't a normal guy, and after that it worked well. A fun read, a good twist at the end. And, ya know, probably not that far away that we'll see people like this. 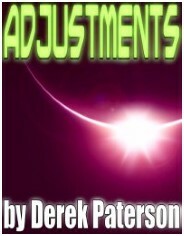 Congratulations to Derek Paterson and his story "Adjustments." Christopher Cobb of Strange Horizons reviewed Jackhammer E-zine and wrote " . . . you'll be surprised at the way the protagonist's strange mentality opens a window onto a quite different sort of tale . . ." Head on over to read what else he had to say about Derek's story and other e-zines. Just saying, some of the older links below might not work any more. Copyright © 2000 by the Author. All Rights Reserved.